Saturday was the big day. 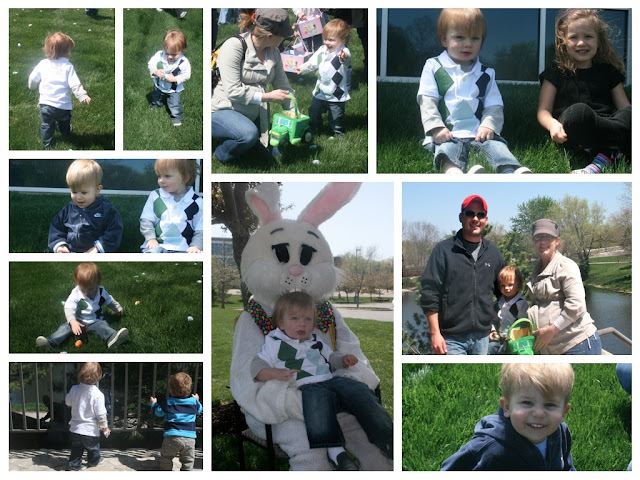 Kaden had his first Easter Egg Hunt. Did I get him prepared enough? Would he be the fastest kid under 3 and collect the most eggs? Or did he stand in shock and just watch all the other kids pick up his eggs? Well, I am happy to report, Kaden did GREAT! He actually found the first of the 24 GOLDEN eggs. Okay, I might have spotted it but Kaden was already heading straight for it so it was just a matter of time before he picked it up, I just hurried him along before some bigger kid came barreling through! After he found the golden egg, he ran for the grass and picked up an egg here and there but for the most part he just wanted to jump and crack them open. Next thing I know, he has a chocolate chip cookie in his hand. Where did this come from? I'll tell you, my child is a klepto, he stole a cookie from some other little kiddo's Easter Basket. After the excitement settled down from the hunt we got in line to see the Easter Bunny. We weren't too sure how he would do since we didn't get to Santa in time but while Daddy waited in line, Kaden and I watched the other boys and girls get their pictures taken. By the time it was his turn, Kaden was ready to go. Daddy picked him up, sat him down and Kaden froze. No crying but no smiling either. 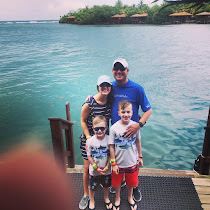 He wasn't too sure about this whole fluffy white person but when his time was up, he got down and happily waved bye-bye to Mr. Bunny-where was that enthusiasm while he was sitting on his lap? Now that the hunt and the pictures were done, it was time to run and play. Kaden got to play with Cousin Colton, Cooper and Jackson, and Hannah and Jake. The kids ran and ran and when it came time for nap time, he slept and slept! As soon as Kaden woke up from his nap, our visitors had arrived for the night. Uncle Adam, Aunt Becky, Cousin Colton and Grammie Janet all came over for some of Daddy's famous burgers. Soon after dinner it was Kaden's bath time (nightly routine to remove all the allergens per Dr. Rawson). Colton wanted to continue to play so we just stripped him down and put him in the tub too. Their favorite game, dumping water out of the tub-they laughed and laughed. Grammie Janet just laughed and laughed. Mommy and Becky-not so much. After bath time we got to experience the loudest, yet funniest, game of tag ever. The boys just chased one another around the kitchen and squealed the entire time. Needless to say, Kaden slept like a baby that night and didn't wake up until around 8 on Sunday! I just wish I would have caught some of this on video to share! But, we always have next time!